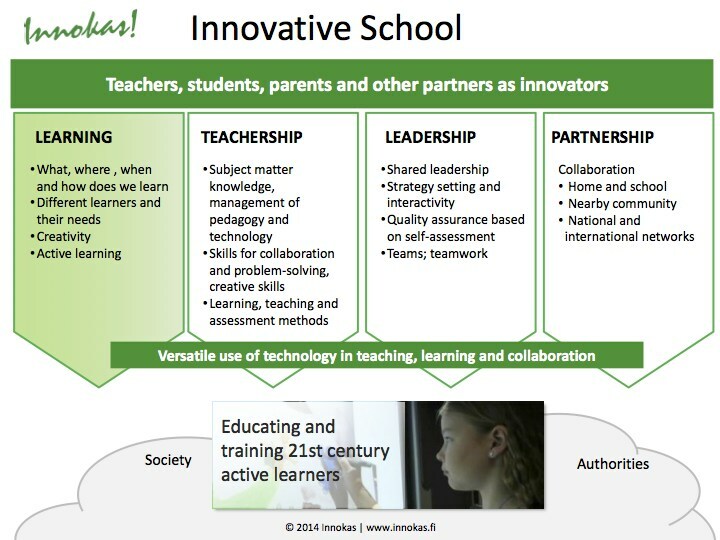 Innokas Network thinking is based on the Innovative School model. The model, also known by the acronym ISC, is a model of a future school based on Innokas Network research. The model describes the main factors that enable the successful learning and teaching of 21st Century Skills in a school. The model consists of four interdependent main factors; Students’ learning and learning environments, Teachers’ professionalism, Leadership and Partnerships. A key guiding principle in the model is the comprehensive and versatile use of technology in learning and teaching, in school’s daily operational processes and as an enabler for educational innovation aimed at school development. In addition to teachers and the school management team, key actors in the ISC model include the school’s students and other personnel, as well as individuals in the internal and external partnership networks of the school. The external partnership networks include parents, local community organizations and companies, as well as national and international networks. ISC emphasizes the role of all of these actors as innovators and encourages them to collaborate in the planning, implementation and further development of the school’s activities. These development activities are ongoing, iterative and cyclic, are based on assessment and are aligned with the latest technological and societal development.